Welcome to the Berry Islands! The Berry Islands are a beautiful secluded gem with about thirty islands and over one-hundred Cays located in the northwestern Bahamas. The Berry Islands are filled with plenty of fun in the sun with pristine beaches and sunsets, world-class fishing and superb snorkeling. 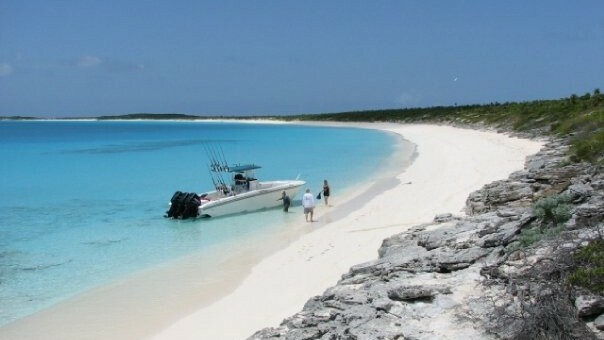 While the settlement of Great Harbour is in the far north of the island chain, and Chub Cay is in the far south, we are located right in the middle... where all the fun is! We are a full-fledged bar for the thirsty traveler and offer an authentic casual Bahamian dining atmosphere for those with an appetite for good food. Stoping by for lunch while snorkeling the nearby reefs, enjoying the sunset over dinner or staying in our cottage, we guarantee you will feel relaxed and refreshed! Safe harbour, panoramic views, cottage rental, beer, liquor, Chester's famous Rum Punch, conch, fish and a fun laid-back atmosphere are all reasons why people choose to stop by. We'll point you in the right direction for snorkeling, diving and fishing spots, or better yet, provide you with an experienced local guide! Flo's Conch Bar is visited by local patrons, passing boaters and occasionally the rich-and-famous because of it's secluded and relaxed atmosphere. Some of it's more well-known customers include Brad Pitt, Shakira, Penelope Cruz, Big-and-Rich, and Sylvester Stallone. Stop by and be surprised on who you could meet! Freshly caught Conch that’s been battered and fried. Great as an appetizer, finger food or get enough for a full meal. Comes by the dozen.